I’m a big fan of applications that have the power to dig into areas of the operating system including drivers, registry startups, registry keys, running programs and processes, browser plug-ins, and home page settings, etc. This type of application can be expressly designed to search for malware infections, or, if not designed to specifically do this, can be used creatively to effect the same result. Experienced, and advanced computer users, are almost sure to be familiar with HijackThis, a very popular tool that does just that. 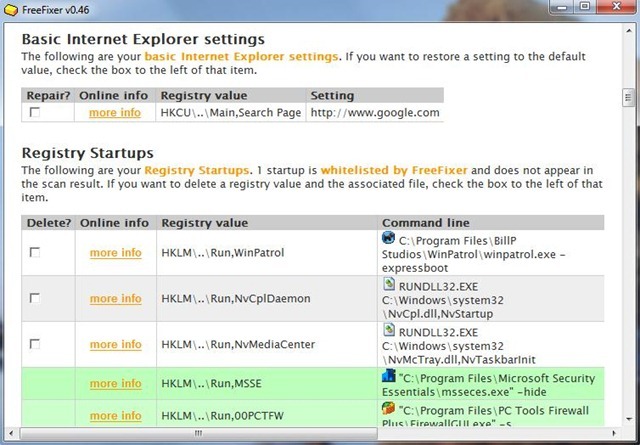 There are alternatives however, and if you are an experienced or advanced computer user, and you’re looking for a free program as an alternative to HijackThis, then FreeFixer (last update December 10, 2009), is a free application that’s worth taking a look at. The program operates as a detailed system analysis tool that can help you in the detection and removal of Hijackers, Spyware, Adware, Trojans, Worms, and other malware. It doesn’t offer live protection but instead, it examines your system, determines if it’s been infected, and then allows you to eradicate the malware. 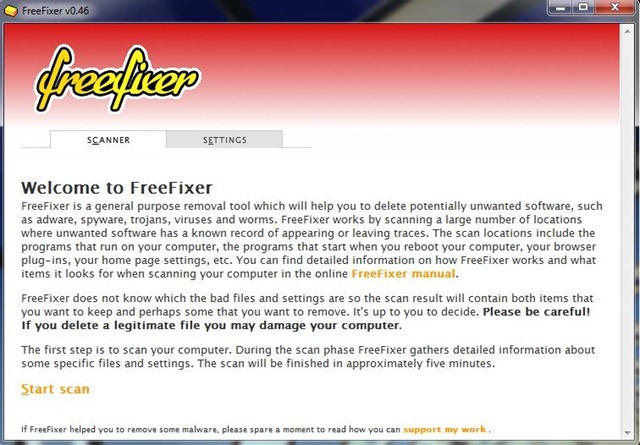 FreeFixer setup is simple, following which you will be taken to the start scan screen which explains in clear language, what the program does and equally as important; what it does not do. 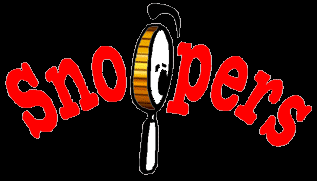 On completion of the scan the results will be presented, broken down into categories, and you will then have the opportunity to remove entries that you consider unwanted, or malware. The real benefit in running FreeFixer rather than HijackThis is; the option you have of following a “more info” link to FreeFixer’s database for information on a specific item. Available information includes, digital signature data, and other users’ experience with the specific item, and more. 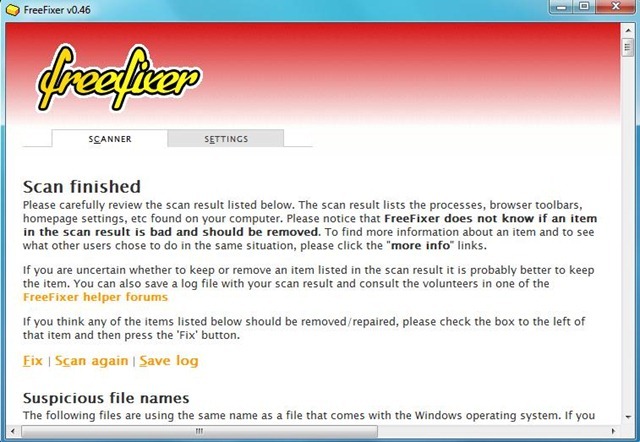 Known software and trusted Windows components are excluded from the scan, which reduces the workload substantially. You can now focus on the potential nasties. As an added benefit, you can turn for advice to an active FreeFixer Group or online forum, where skilled users’ will analyze your submitted log file, and then guide you accordingly. The graphic below (captured today), illustrates the type of help a user can expect from the user group. 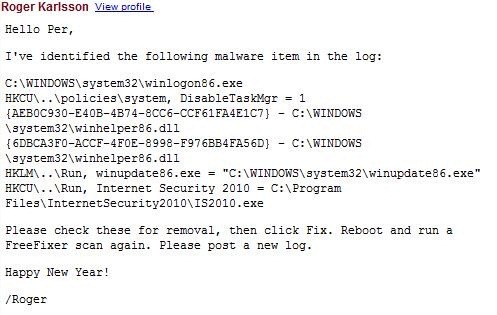 Fellow security techs will recognize, that this user has been infected by the notorious rogue software application, Internet Security 2010, which has, amongst other things, disabled Windows Task Manager. Recommendation: If you are an experienced, or an advanced computer user, and you’re looking for a program to strengthen your anti-malware resources, then FreeFixer is one that’s worth taking a look at. System requirements: Windows 2000, Windows XP, Windows Vista, Windows Server 2003, Windows Server 2008, Windows 7. Great application! Highly recommend this. Glad to hear you’ve had a good experience with this excellent application Liam. Looks like a promising tool but is not as yet compatible for 64bit systems. I hear ya – with more and more of us driving 64 bit systems, I’m finding that developers are just a little bit behind. Oh, well. Just tried this out, I like it, has been added to the arsenal. Only criticism I do have is their online database, I tried to look up a few things and there was no or little information. Not a huge problem, I just went to the System Lookup site. That’s cool. I think you’ll find, that over time, this application will prove its worth. I love free software and thanks for this useful security tool. New tool for me, will definitely test it to judge it capability. I’d be interested in your views on this software, after you’ve had a chance to try it out. A very interesting new (to me) solution. Thanks Bill I’m running it on my Thinkpad I had the issue with recently. It seems like new solutions to the malware problem are quite good, it also looks like a great portable app but I haven’t tried it that way yet. I remember the ThinkPad problem – hope this helps. If you get this to run as a portable app, I’d like to hear about it.